The Durham County Golf Union is at the heart of Golf in the County and our modern approach means we are always aiming to enhance the golfing experience of all levels of golfer that participate in County events and schemes. We also support the affiliated clubs of Durham to serve their members and ensure that they are all a valued part of the Union. To achieve this, England Golf are supporting a local campaign to help recruit new volunteers across a range of areas including Championships, Course Rating, Marketing, Press/Photography, Handicapping, Officiating and Administration. Volunteers are the lifeblood of our organisation and we recognise everyone’s free time is precious, so any time you can spare is valuable. From helping out at our events for a few hours to taking the lead on specific area such as press/media, there is an opportunity to suit everyone and we will work with you find a role to fit in with your experience, skills and availability. Have skills or experience which could be valuable? Passionate about the benefits of taking part in sport? Want to give something back to the game? Some spare time to offer? Press/Media officer - To write news stories, take photo's at events and liaise with local press and media contacts. Course Rating Team leader - To train up on the USGA rating system and support the Standard Scratch rating of Durham's 45 courses. Rules Officials - To train up on the R&A Rules of Golf to support the smooth running of County Championships and Competitions. Competition Administrators - To support the County Secretary in ensuring County events are planned and delivered professionally. Special Projects - If you are good with IT, databases and websites, this is the one for you! Team Administrator - Supporting the County Captain in ensuring that the County Teams are well prepared and organised. If you are interested in volunteering with Durham please complete and return the an Expression of Interest form and you will be contacted to discuss the opportunity further. 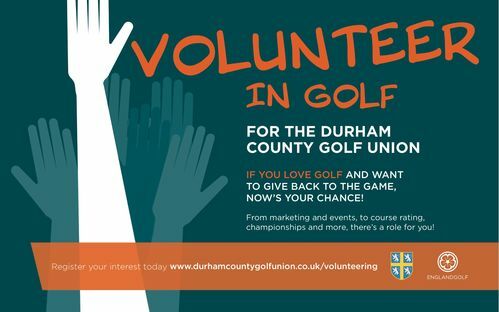 Alternatively contact Jonathan Ward, County Secretary, for an informal chat about volunteering on 0191 3740788 or email secretary@durhamcountygolfunion.co.uk. Volunteering with us is an enjoyable and rewarding experience, with our championships and team programmes presenting the opportunity to support the development of the County's most talented players. Our current volunteers are very friendly and welcome like minded individuals both young and old into County activity to support the work of the DCGU. Training on areas including rules, handicapping and course rating are available to help volunteers fulfill and enjoy their role with the DCGU. One of our officials has even progressed on to officiate in National Championships and International Matches! There is also an opportunity to be elected onto the County Executive Committee to contribute towards the governance of the DCGU should you enjoy your volunteering experience and your club decide to nominate you, but this is not an expected progression for those who just wish to give something back. All volunteers receive agreed out of pocket expenses for their individual roles to ensure that cost is not a barrier to volunteering with us and DCGU branded clothing is available to those who commit their time. Its not all work work work though, as there are also several opportunities play some golf and at some great venues within and outside of Durham too! So... whether it is just a few hours you would like to give back to golf, a passion for an particular area of the game, or to gain some valuable experience with a view to a career in the sport.... we'd love to hear from you this season! DCGU Volunteer Ad - Northern Golfer March 2018. .